Social media has really changed the way brands are connecting with their customers. More and more companies are starting to realize the value of social media and are quickly adapting this new form of communication. However in order to have a successful social media strategy, it is important to have an internal culture that is ready to accept and learn. 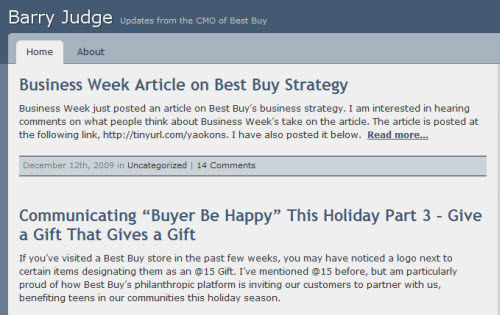 Best Buy has been a brand at the forefront of social media, using blogs, social networking tools, forums, and video to build brand awareness and keep consumers up-to-date with Best Buy news. A number of large corporations are benefiting from social enterprise solutions to help manage their customer relations and improve their social media strategy. 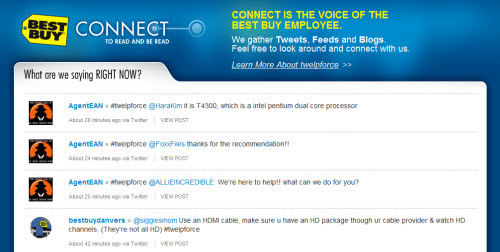 Let’s take a look at all of the different social outlets Best Buy uses to communicate with customers. Even Barry Judge, the Chief Marketing Officer, is getting in on the mix. This is a critical part of the Best Buy social media strategy. By the CMO taking the time to blog about what is happening with Best Buy, shows regular consumers that even top-level executives take the time to give updates on whats new with the company. 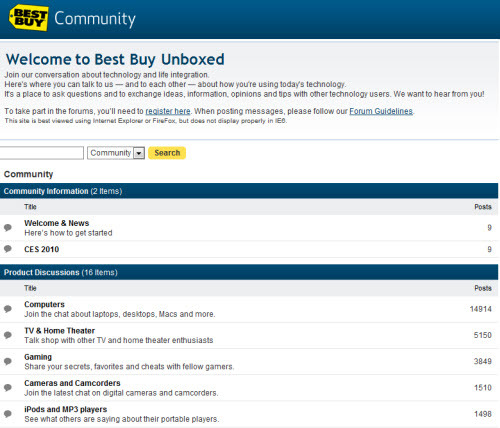 Best Buy has given people a platform to share and discuss technology and tech-related products. Join any of the “Product Discussions” and discuss topics like Computers, TV, Gaming, Appliances, Audio, Cameras, iPods, Mobile Devices and more. They also have a section for “Customer Service”, “Reward Points”, and “Meet the Moderators”; who by the way take the time to make sure the forum is a stimulating environment were there are valuable conversations. 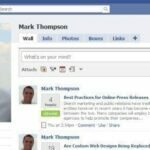 Just like any typical Facebook Fanpage, they have their basic company info and wall, however Best Buy has built a way to bring casual Facebook users into their website. They have added the “Shop + Share” tab, that allows users to view the weekly ad and promotions that are running. You can also connect with your local store, get free answers to your tech-related questions, and browse great gift ideas. By using Twitter, Best Buy is able to tie all of their marketing pieces of the puzzle together, by posting blog updates, product releases, new promotions/offers, new store location, and more. Not only can Best Buy enthusiasts keep up with updates, but Best Buy is using Twitter as a customer service tool, responding to unhappy and satisfied customers. Just like any other brand or company, Best Buy can listen to what is being said about @BestBuy and respond if appropriate. They have also taken advantage of using a custom Best Buy background, that shows off employees, along with urls to all of their social media outlets. Another great way to build branding and awareness of their other social sites. Best Buy Connect is a concept that lets the typical employee, have a voice. Connect, will gather tweets, feeds, and blogs from all over the Best Buy communities and deliver it to one centralize location. Customers can gather free knowledge and information about tech products by browsing the Best Buy Connect site or by reaching out to one of the employees. What better way is there to have REAL customers, connect with REAL employees. If an employee was able to help out a potential customer with a tech question, you can almost count on them to visit their local Best Buy store to pick up the product. Again, giving that level of personal touch is another fantastic way to engage their customers. I’m sure you have seen hundreds or even thousands of company surveys in your e-mail box. Well here is a way for Best Buy to gain valuable feedback from its customers in an unobtrusive way. IdeaX is a community where you are allowed to share, vote and discuss ideas and ways Best Buy can improve their business. A community-drive site, that will allow Best Buy to observe what ideas are ranked the highest, to help make improvements to their company. This is a great video produced by Best Buy that talks about how they use to market their brand and products. Then they show how marketing has transformed into social media and how it is not only helping Best Buy spread the word about their brand, but how it is helping their company become better and more efficient. This video is a great way to show how Best Buy is making a concise effort to connect consumers to products with the use of social media. After watching this video you feel like you are part of the Best Buy family and have built a new level of trust. 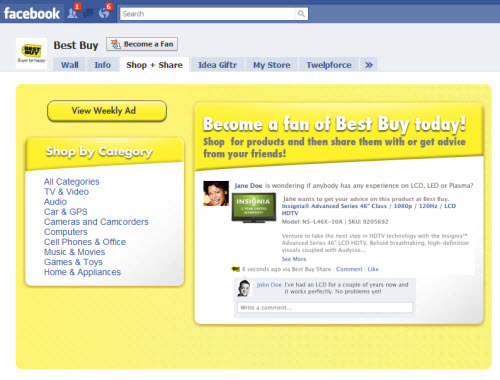 Best Buy has set the standard for how companies can use social media to impact a company. You can see from all of these different strategies, how each of these have a different goal in mind. Increase the level of customer service, build trust, promote offers & products, build brand awareness, gain feedback on improving…all of these things help to make Best Buy a more profitable company. Now it’s up to companies to either embrace social media or be left behind.